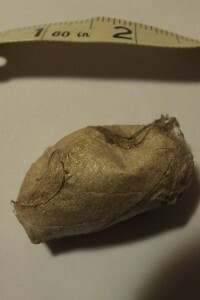 The bare, ugly forests of late winter do have one fun thing to find: cocoons. And the harsh windy storms of this past winter flung some of them onto the ground. A week ago I found just such an odd pod under an oak tree in Prospect Park, Brooklyn. I found two great sites to help me figure out what I had on my hands. Butterflies and Moths of North America has an extensive library of pictures that you can search by lifestage. They led me to think Polyphemus moth, though I never heard back from the site. Either way, I have hit the cocoon jackpot. These are both giant silk moths, as in, they are as big as a sparrow and a lot flashier and more fun. If all moths looked like these guys, people wouldn’t even mind having their clothes eaten by them. Marlos, who has been identifying bugs for strangers since 1998 in newspapers, online and with the help of his book The Curious World of Bugs, assured me that if the cocoon is viable it would hatch into a gorgeous creature. And that I wouldn’t even have to feed it because the moth stage has no “mouthparts” so it can’t eat–only reproduce. Is it viable? I can only anxiously wait and see. I have been burned by cocoon hopes before. I remember finding some kind of chrysalis when I was in fifth grade at North School in Des Plaines, IL. I kept it safe in my desk the entire school year and regularly checked its condition. Mrs. David never new, but then nothing ever happened, either. It was kind of smelly when I threw it out. 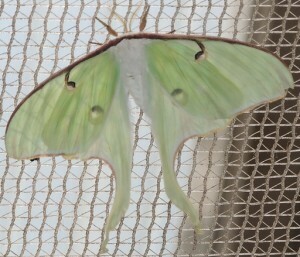 It could become this green beauty, the luna moth. 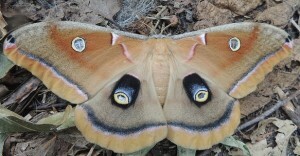 Or it could be this giant brown moth with fake purple eyes, Polyphemus Moth (Antheraea polyphemus). I have seen a grown Polymethus moth and a luna moth caterpiller in this same park. So I think I could release either and it would find a mate. I also got a tip from glorious-butterfly.com that I should tip or, preferably, superglue the cocoon upright so that the moth doesn’t come out all mangled. Another weird moth thing I discovered: you can buy them online. Your basic saturniidae moth cocoon is going to run you $5-$10. Carolina Labs has living luna moth three pack for $18. Now, if you’re willing to take an earlier egg stage, you can get some discounts, but you will have to set it up with the appropriate food supply and hope it doesn’t get eaten. You can get more prosaic butterflies from a number of stores, including Amazon. There are people who are now making a living as moth breeders! Well, I’m not sure how much they’re making, but they’re out there (and hiring in Canada). I wonder if they can train dogs to find cocoons the way they get them to sniff out shed antlers. There’s something that seems slightly wrong about this, like it could introduce diseases or something and we’re now keeping butterflies as livestock for fun. But if it means more moths and butterflies in the wild? Well, it’s certainly a better hobby that catching and pinning a bunch of butterflies. And, as the mother of a toddler, I suspect I’ll be be checking out these cocoon suppliers in the next few years.